Powell’s boys basketball team has a slim lead in the Knox County Middle School League as play resumes this week after the holiday break. Darin Courtney, in his 15th season as head coach, knows his Panthers can’t afford to have any slipups down the homestretch if they want to capture the 2016-17 regular season title. “We’ve been fortunate to pull out some big wins and we’ve got to keep working hard and improving to achieve our goal of a regular season championship, which would give us the best opportunity in the tournament,” said Courtney. Powell and Vine both have 8-1 league records, but the Panthers currently own the tie-breaker over the Golden Bears by virtue of their 50-43 win at Vine on Dec. 19. “Vine was a game of runs, and very competitive down to the last minute or so,” said Courtney. Other close games for Powell have included a one-point win over Karns and a three-point win over Bearden. South-Doyle, which is tied with West Valley for third place, handed the Panthers their only loss early in the season, a 12-point setback at Powell. The Panthers will take a 17-1 overall record into their next game Thursday at rival Halls. Girls action starts at 4:30 and the boys contest at 5:30. Powell’s other remaining games will be against Cedar Bluff, Carter and Whittle Springs. The Panthers’ starters are all eighth graders. J.R. Jones is the point guard. Parker Haley and Logen Sutton play on the wings. Noah Chapman fills the No. 4 spot as a wing/forward. Cole Kollenburg and Coltin Reynolds share playing time at the No. 5 center position. “We’ve really been balanced in scoring throughout the season with J.R. being the leading scorer at times and also the floor general,” said Courtney. 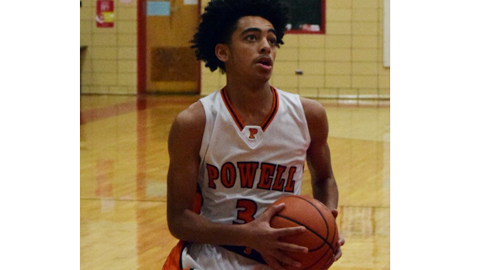 The Powell coach likes his team’s chemistry. “They’re normal kids in the locker room and have a lot of fun,” pointed out Courtney. “When it comes time to practice, there’s no nonsense . . . They come to work. Courtney has guided four teams to regular season titles and three to post-season tournament crowns. His 2002-03 and 2011-12 teams swept both. Powell opened the season by winning the Tommy Bettis Memorial Tournament at Maury Middle School in Dandridge. The Panthers also were champions of the recent Halls Christmas Tournament, defeating Gresham in the finals and LaFollette in the semifinals. Farragut tops the girls standings with an 8-1 league record. Carter and West Valley are tied in second at 7-1. Powell and Karns are each 7-2, with the Lady Panthers having the tie-breaker advantage with their win over the Lady Beavers. The top two finishing boys and girls teams earn first-round byes in the post-season tourney, which starts Feb. 2. Karns Middle School will host the finals on Feb. 9. The host school swept top honors in the West Valley Christmas Classic. Tourney MVP Zneyah McLaughlin, her team trailing by one with 6.1 seconds remaining, sank both ends of a 1-and-1 to lift West Valley girls to a 31-29 win over South Cumberland. After her two clutch foul shots, she stole the ball and made one more free throw for the final margin. The Wolves edged Bearden 30-27 in the boys’ finals.